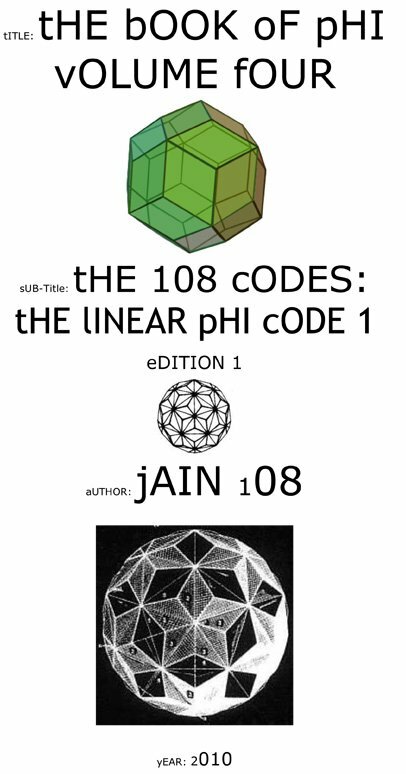 Jain 108, the mathematical sleuth, the synesthete, the philomorph (lover of forms), the mathematical monk, the numerical nomad, the para-physical code-breaker, has gone deeper down this Phi Code 108 rabbit hole. 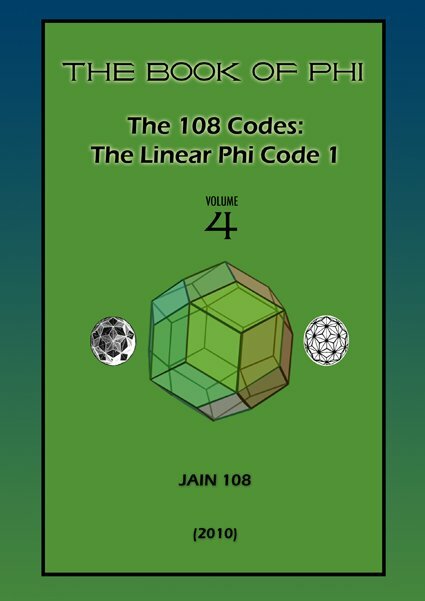 In volume 3, he introduced us to the Phi Code 108 pine cone maths, and now in this epochal book of volume 4, he reveals extraordinary phine details never seen before in print. 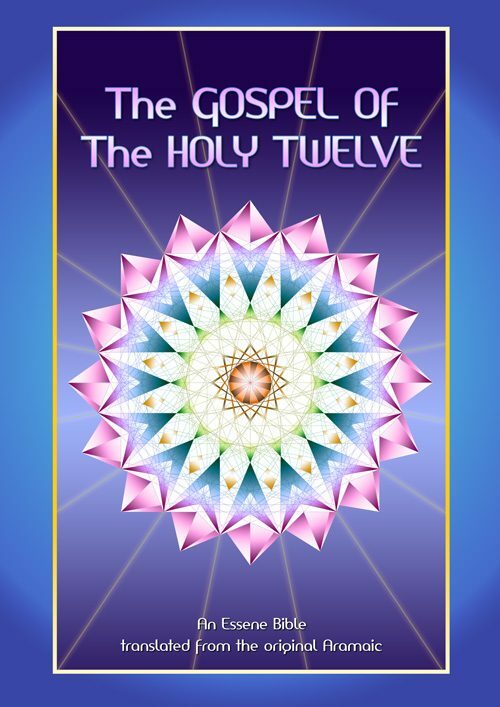 This book has the first complete dictionary of all references to Sri 108, the first book of its kind, an incredible collection of facts from all religions and sectors of life that comprise the anointed number 108. 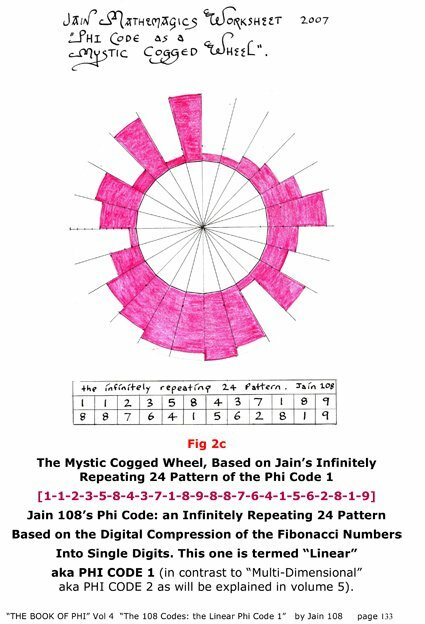 Jain is the first person to mathematically explain, via Digital Compression and the 24 Repeating Pattern that sums to 108, why a billion people on this planet (the Hindu religion) literally worship this number, this ancient frequency that is steeped in the mathematics of flowers and crystals and the human canon. 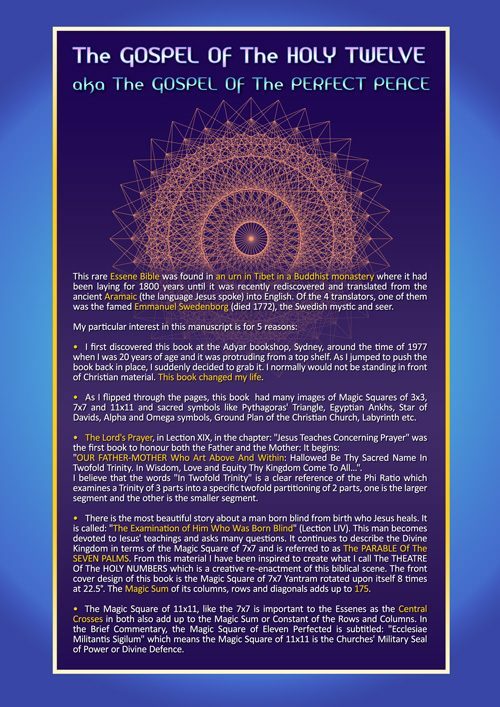 This 108 compendium or encyclopedia is like a mathematical detective story having a denouement as magical as it is indisputable, as baffling to professors of mathematics, geometry and technophiles as it is simple in its precise and grand design being lucidly based on nature’s rawest eco and bio principles. 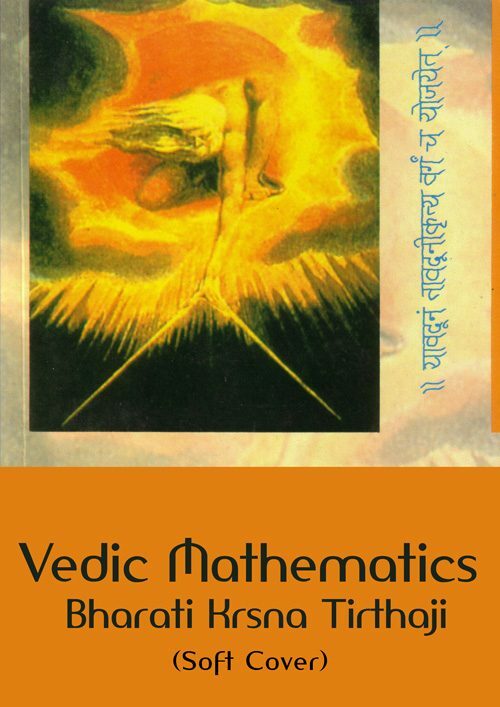 This book contains 197 photocopied pages, is hand-written in parts but mainly computerized, highly illustrated, the book is a golden rectangle but fitted or orientated to A4 landscape , and wire bound. As a sequel to the Da Vinci Code, already based in the mass consciousness, here is the next riddle, solved. 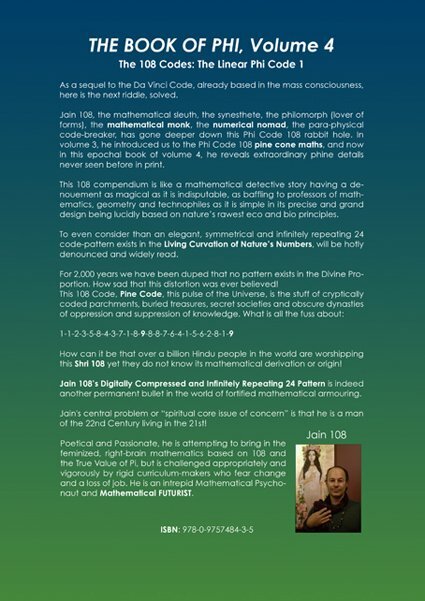 This 108 compendium is like a mathematical detective story having a denouement as magical as it is indisputable, as baffling to professors of mathematics, geometry and technophiles as it is simple in its precise and grand design being lucidly based on nature’s rawest eco and bio principles. To even consider than an elegant, symmetrical and infinitely repeating 24 code-pattern exists in the Living Curvation of Nature’s Numbers, will be hotly denounced and widely read. For 2,000 years we have been duped that no pattern exists in the Divine Proportion. How sad that this distortion was ever believed! 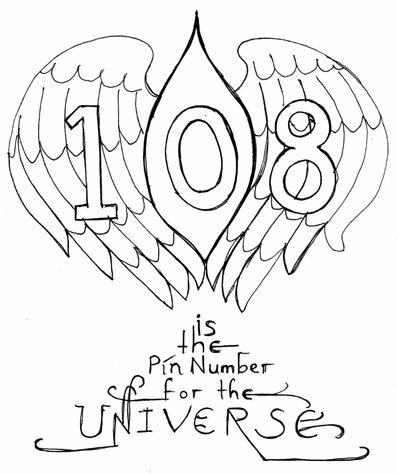 This 108 Code, Pine Code, this pulse of the Universe, is the stuff of cryptically coded parchments, buried treasures, secret societies and obscure dynasties of oppression and suppression of knowledge. 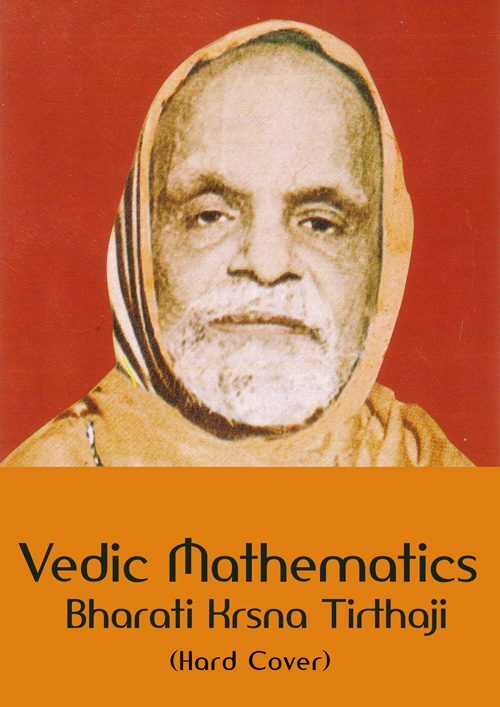 How can it be that over a billion Hindu people in the world are worshipping this Shri 108 yet they do not know its mathematical derivation or origin! 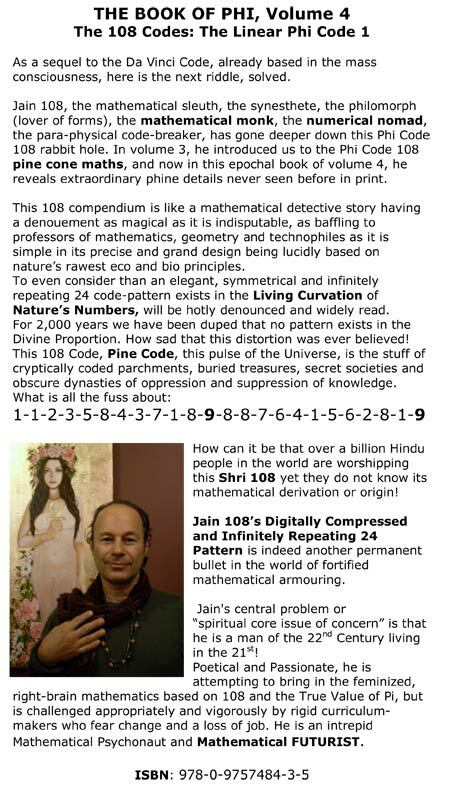 Jain 108’s Digitally Compressed and Infinitely Repeating 24 Pattern is indeed another permanent bullet in the world of fortified mathematical armouring. Jain’s central problem or “spiritual core issue of concern” is that he is a man of the 22nd Century living in the 21st! 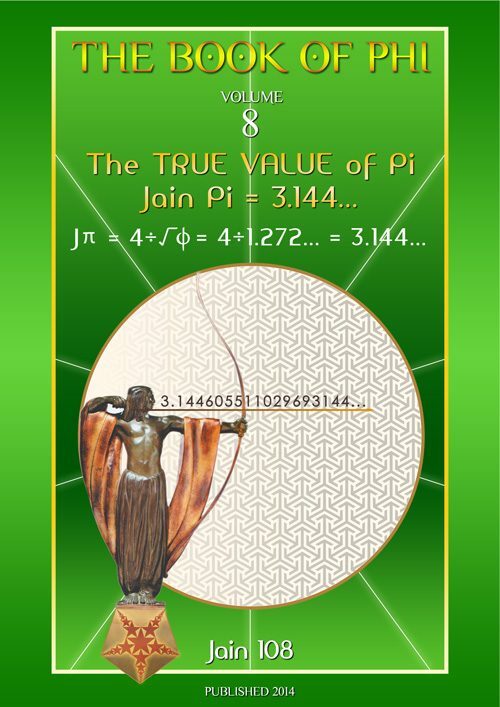 Poetical and Passionate, he is attempting to bring in the feminized, right-brain mathematics based on 108 and the True Value of Pi, but is challenged appropriately and vigorously by rigid curriculum-makers who fear change and a loss of job. 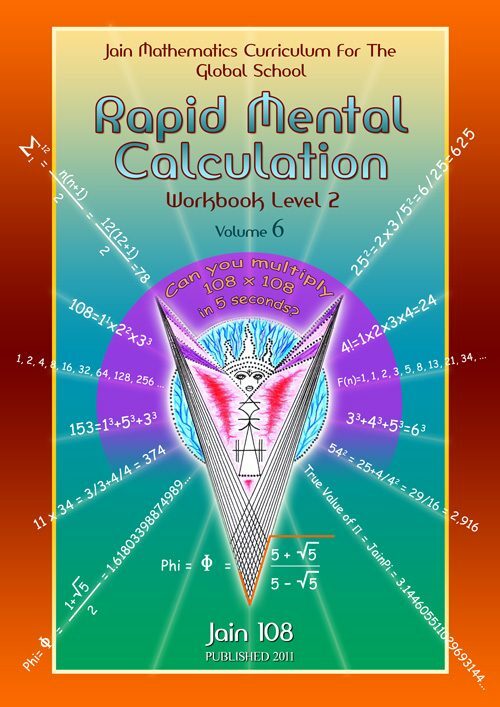 He is an intrepid Mathematical Psychonaut and Mathematical FUTURIST. 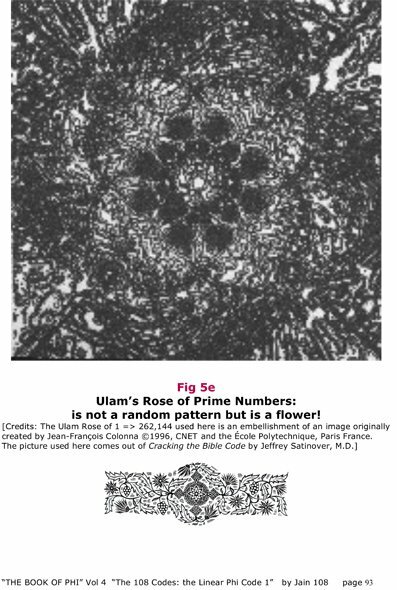 Part 1: The Definition of Primes and Ulam’s Rose. Phi Code of 12 Pairs of 9 superimposed upon a background generated from the family of Complex Numbers, in this case, generating a 12-rayed design. “Baalbek” an ancient roman city for the gods. I visited this place with my Lebanese Parents, when I was 15, and it altered my life towards seeking the mystical and the realms of ancient knowledge. 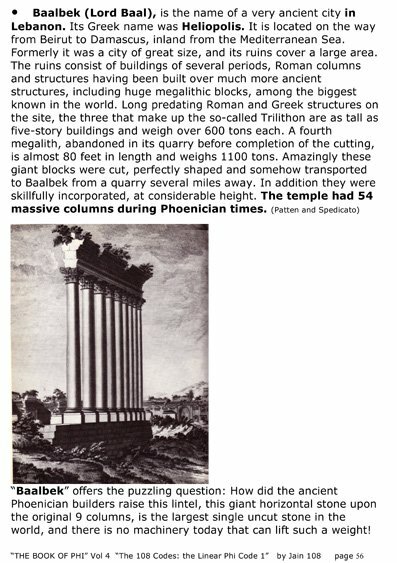 There is one part of this complex building, where the largest stone in the world exists, that is supported upon stone pillars, yet no scientist can explain how the heck they managed to raise this plinth/lintel, yet no modern technology nor crane can lift the weight of this one cut stone…. 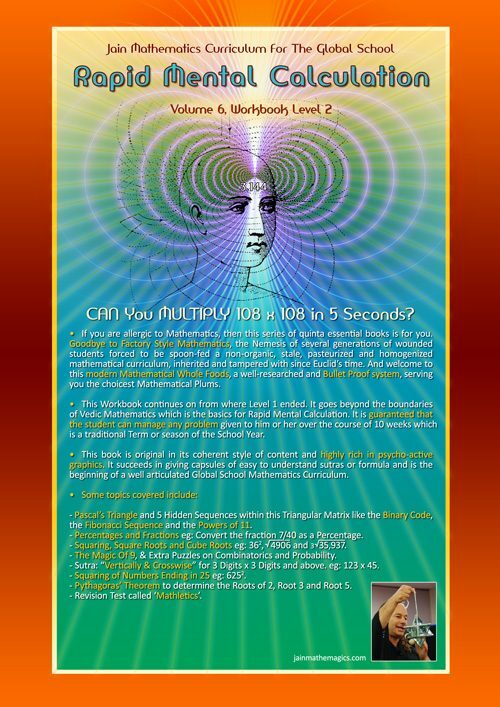 only metaphysics can explain how this was done, by understanding the use of the fractal unified field. 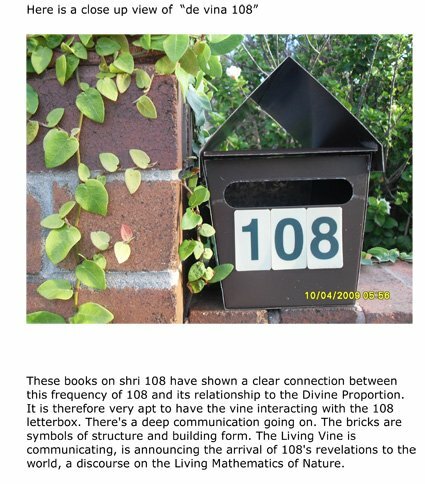 The “108 Letterbox” photo taken on the outskirts of Bondi Beach, Sydney. I like the way the vine grows upon the brickwork, as the word “vine” is part of the modern word “divine” or “de vina” which means of the vine or fractal branching. 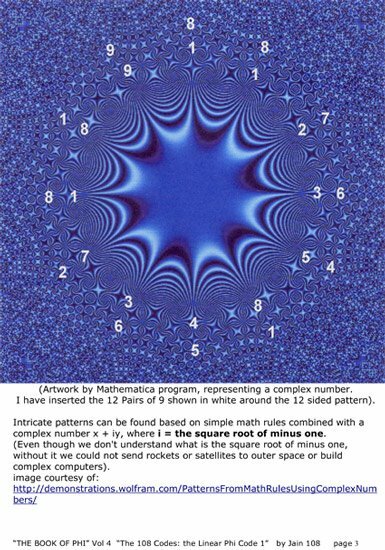 How amazing is that: that the Prime Numbers, when plotted on a spiral of naturally sequenced numbers (1-2-3-4-5-6-7-8-9- etc) generates a flower! This is combined Divine Symmetry and Asymmetry at its best. Interesting! 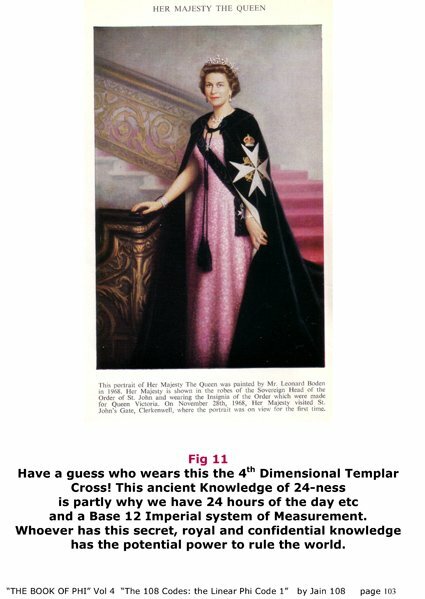 The Queen of England wearing the 4th Dimensional Templar Prime Number Cross. Well if your intent is to rule the world, what better mathematical or galactical symbol would be more potent than this. Well done, my queen. Circularizing the 24 Repeating Pattern upon a wheel of lengths that critically obey the numbers. Its an interesting concept that I have developed and in need of giving it a name, I call it “Mystic Cogged Wheel” and it can be applied to other important sequences. This particular diagram is really a worksheet for teenage students so that they discover this for themselves, rather than just giving them this knowledge. 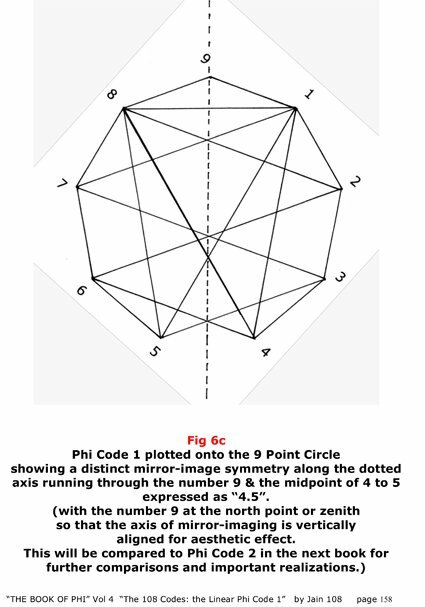 Plotting the 108 Phi Code on the 9 Point Circle shows there is inherent symmetry yet again. It would be interesting to view this 2-dimensional yantra as a 3-dimension mandala.